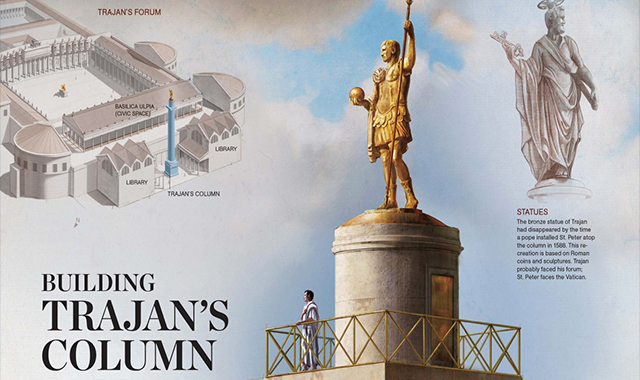 Building Trajan’s Column #infographic ~ Visualistan '+g+"
The Column of Trajan was constructed in 113 CE to remind the citizens of Rome about the two military victories of Roman emperor Trajan in a war in Dacia, which is now the modern Romania. The amazing carved reliefs that spiral around the column recreate the campaigns in Dacia including Trajan himself, addressing the troops, leading the army, rewarding auxiliaries and judging prisoners. The column is still standing in the heart of modern Rome and is among the most admired monuments in the Roman world.